Year on year, autumn in the West End always presents a hectic melee of brand spanking new theatrical productions fighting for your attention in the run up to Christmas. As trees shed their leaves and the frost of winter begins to set in, theatre fans flocks from all over the capital to nail a seat at the best productions on offer. But with so much talent treading the boards, how are you meant to know what to see and what its best to avoid? Make sure you get ahead of the pack with this quick guide to the finest new productions showing in London this autumn. Riding into West London on a tide of rave 5-star reviews, this dramatic realisation of the infamous trials of this country’s favourite dandy is simply unmissable. 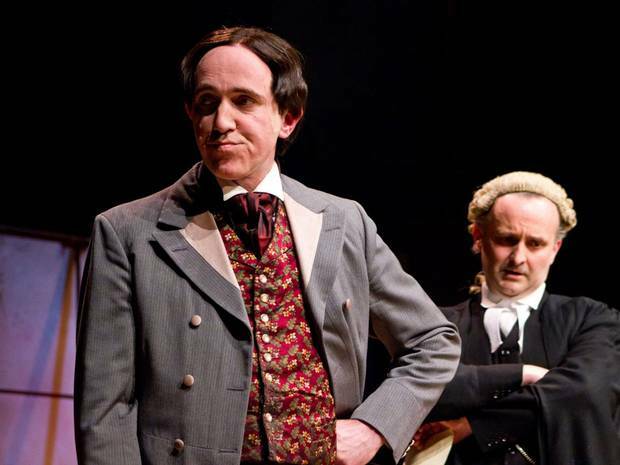 The play, written by Wilde’s grandson Merlin Holland, is funny, heart-wrenching and self-aware – with John Gorick starring as the beguiling Wilde. At Trafalgar Studios from October 13. Follow: @NYTofGB, @Ambtheatre Talking of Wilde, over at the Ambassadors’ Theatre the National Youth Theatre present Selfie, a quick-witted revamp of that iconic tale of deception and vanity, The Picture of Dorian Gray. This hilarious and knowing staging brings literature’s most conceited anti-hero back to contemporary theatrical life with a bang. At Ambassadors’ Theatre from October 8. Perfect if: you think modern life is rubbish, and love a good laugh at selfie-culture vanity. Playwright Macmillan collaborated with one of the world’s leading climate scientists Chris Rapley to create 2071, a dramatic realisation of the future of our planet on stage that focusses on the big questions on everyone’s mind: “What do we owe future generations? How can we protect our children and grandchildren?”. A new and innovative production where science plays centre stage. Perfect if: you’ve been waiting for a first-rate science-theatre crossover, or you’re an eco boffin. Starts November 6, Royal Court Theatre. This stunning production notably welcomes an all-female cast of to tackle one of the Bard’s finest historical dramas. Phyllida Lloyd’s similar staging of Julius Caesar in 2012 stunned audiences on both sides of the Atlantic, and her return to directing duties over her female cast has come with a lot of hype. It doesn’t disappoint: atmospheric, nuanced and wonderfully played, this is a strong contender for new play of the year. Perfect for: fans of the histories looking for a fresh and exciting take on the play, and don’t like the look of the more conventional RSC offering (also showing this autumn, at the Barbican). At Donmar Warehouse from October 3. Confronting our deepest fears about surveillance and paranoia (very current for today’s political climate), Caryl Churchill’s simple yet exceptional four-hander presents a chilling world where everyone is at war, and not even the birds in the trees or the river below can be trusted. Directed by the winner of this year’s JMK Award, Kate Hewitt. Perfect if: if you can handle dark theatre at its most unsettling. At the Young Vic from November 7.